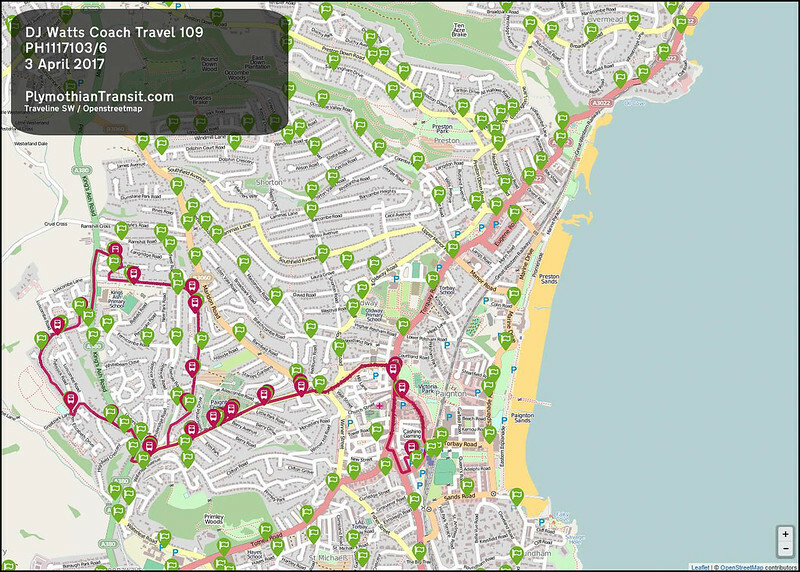 Well, here is probably the biggest ever edition of Devon Transit since all this started. Its a good job I had a week off work otherwise I wonder how it would have all been put together. 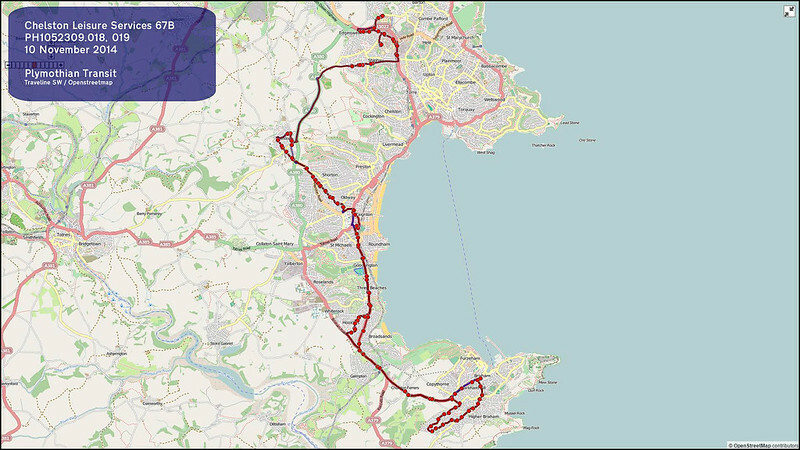 Highlights included the closure of Local Link along with replacement services in Torbay. 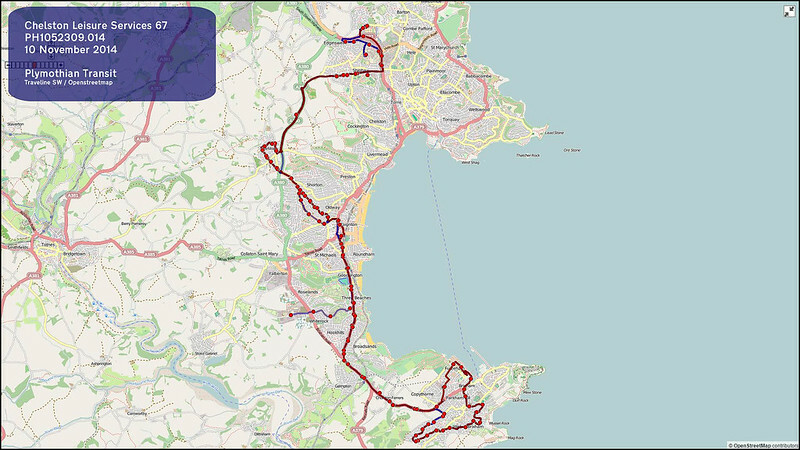 Stagecoach change a few of their North Devon services, and Plymouth Citybus have a raft of changes with a batch taking place in the next couple of weeks along with some more coming up in May. 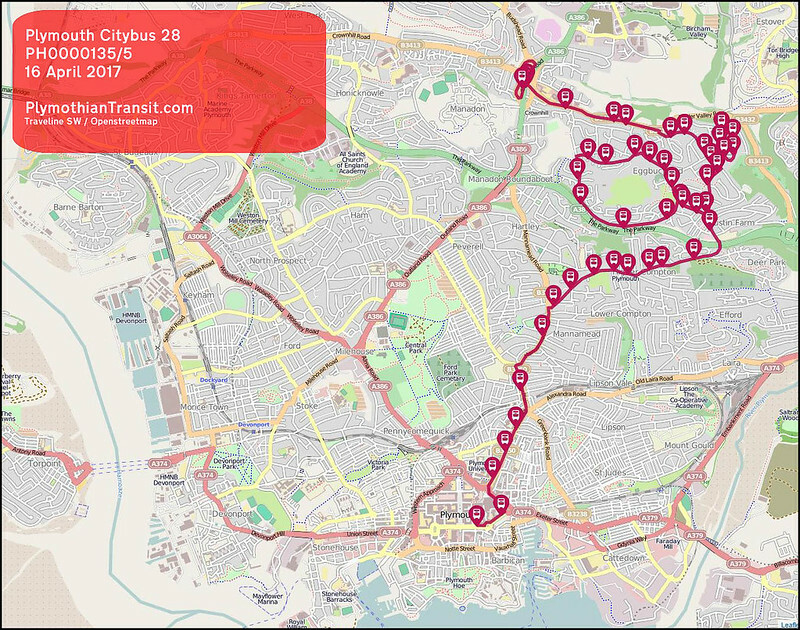 There are more Citybus changes due but these are covered in Cornwall Transit next week. 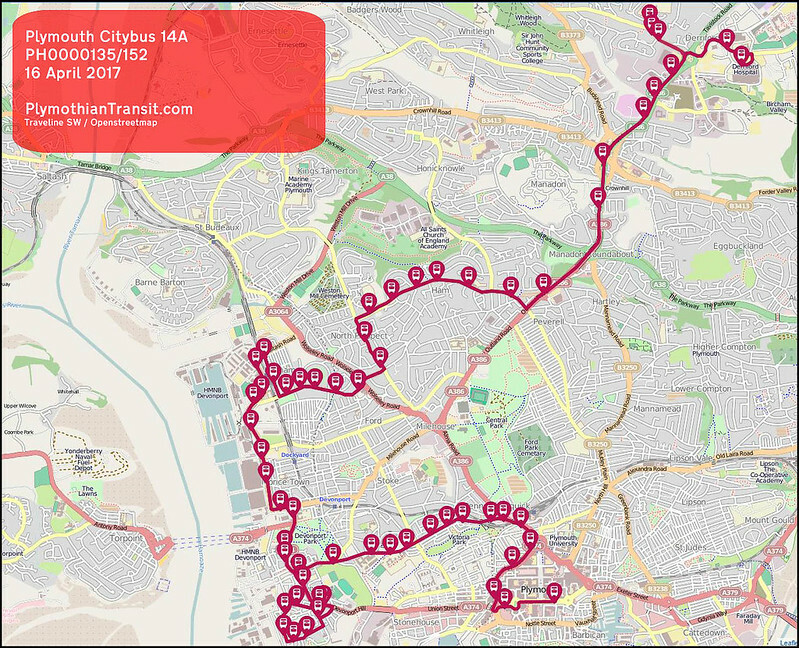 As always click through on the route numbers to the full history of most of the route here. These pages often contain additional information which does not make it through to the weekly Transit posts. 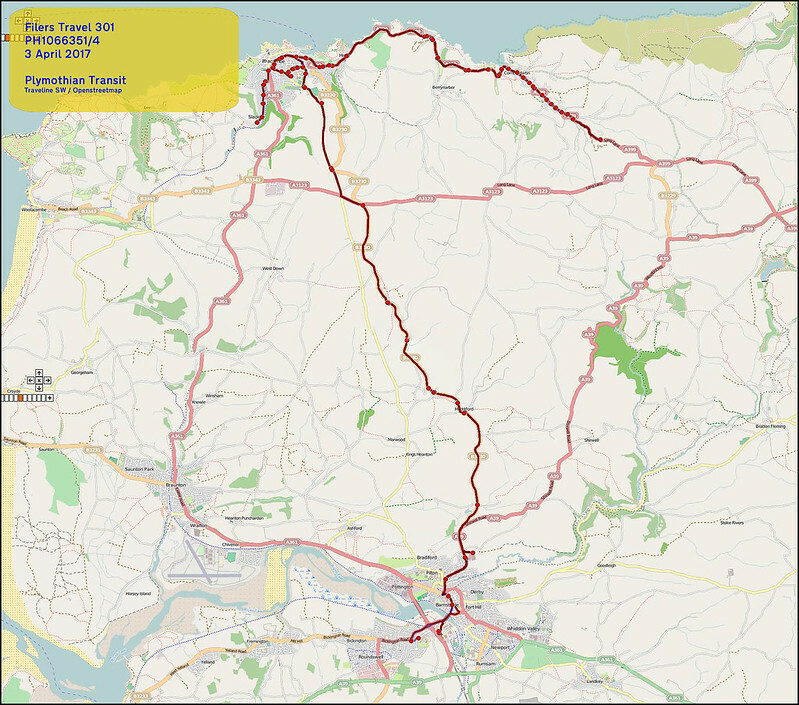 Devon County Council has awarded a tender to Country Bus to operate new service 125, which will operate between Stoke Gabriel, Paignton and Marldon, starting on Monday 3rd April. 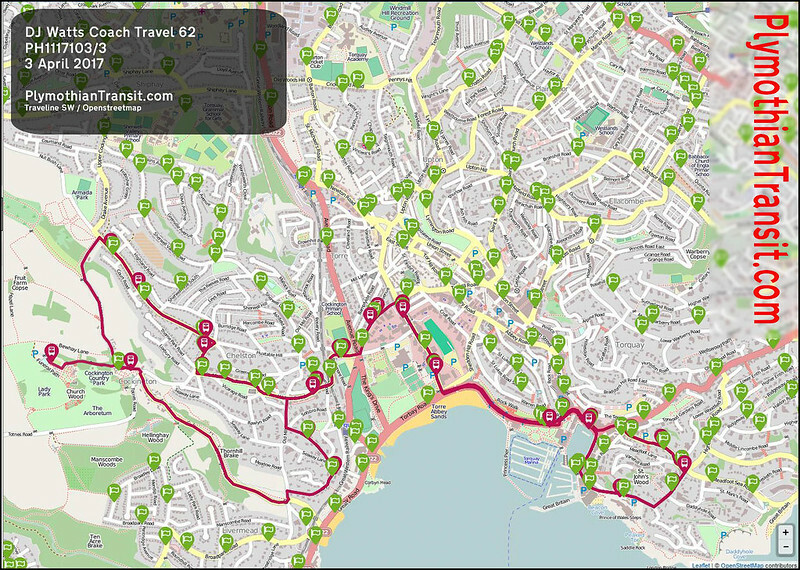 This replaces the withdrawn Local Link service 25 from Paignton to Stoke Gabriel and 67 to Marldon. 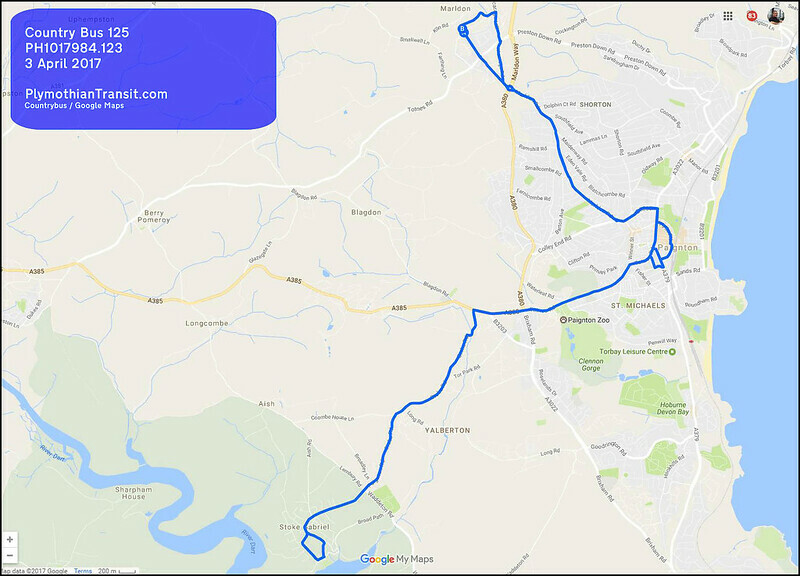 The 125 will operate the existing 25 route between Stoke Gabriel and Collaton St Mary, then direct into Paignton Bus Station via Totnes Road. 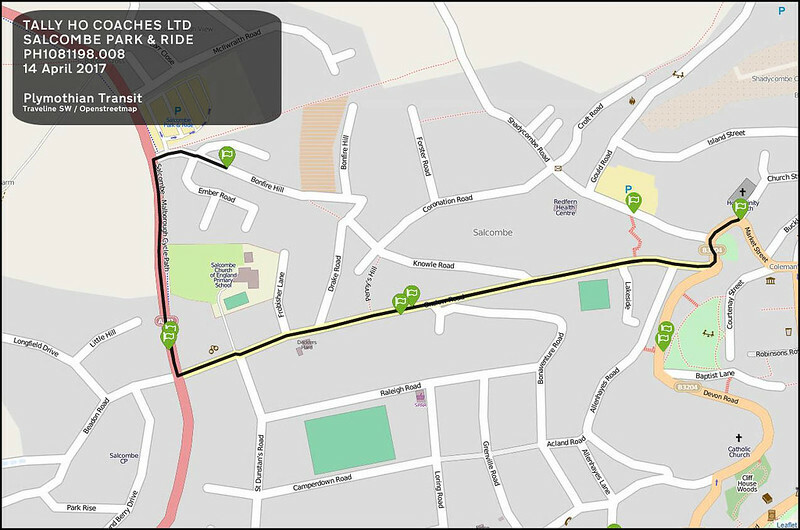 Between Paignton and Marldon alternate journeys will operate via Marldon Road or Maidenway Road. 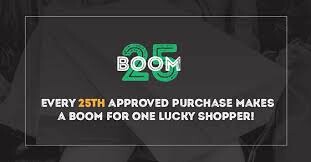 effective from 03 April 2017. 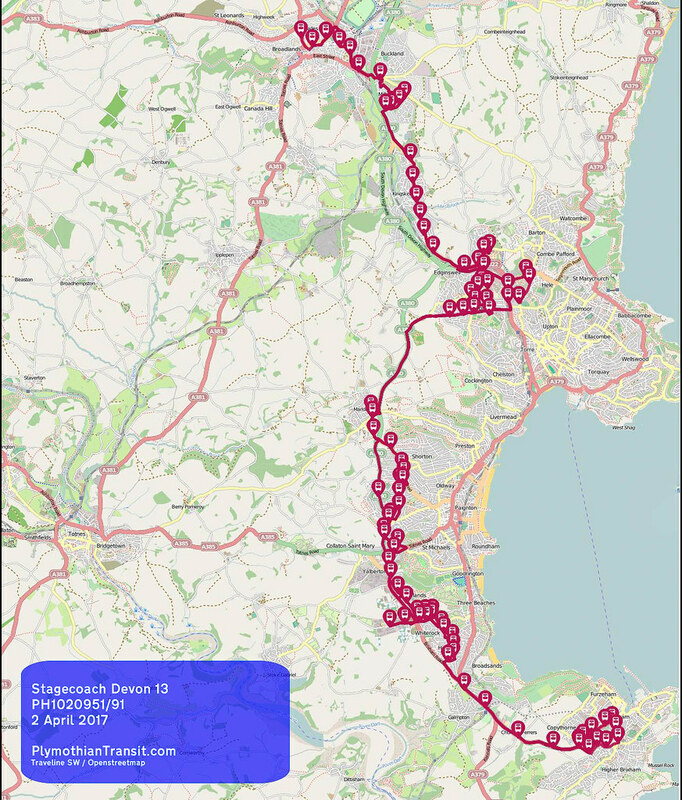 Paignton effective from 03 April 2017. 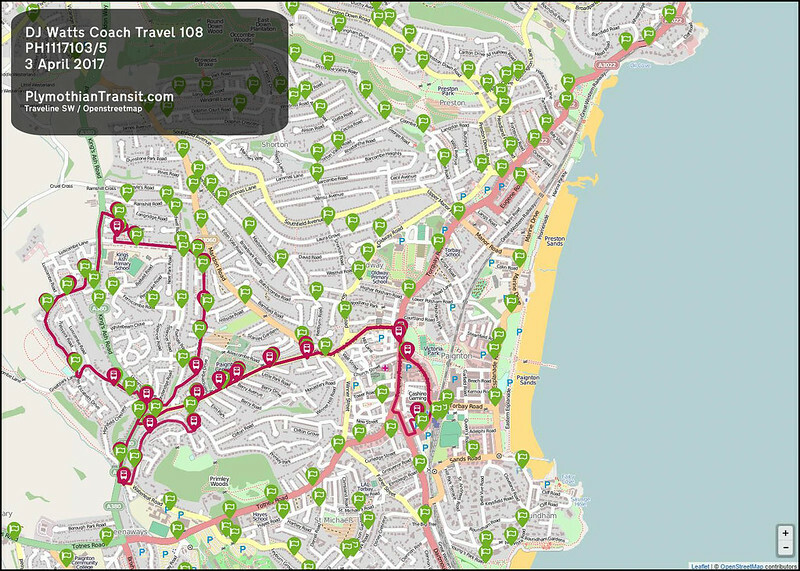 No timetable / map found on line anywhere. 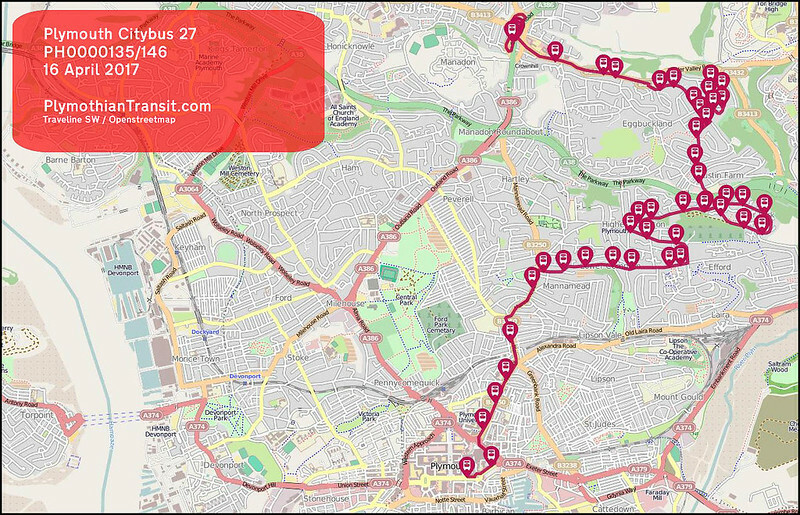 The Jan 2017 timetable is on the main route page - click on the route number above. Filers dont bother to details changes to their own services, preferring to leave it to Traveline. effective from 09 April 2017. 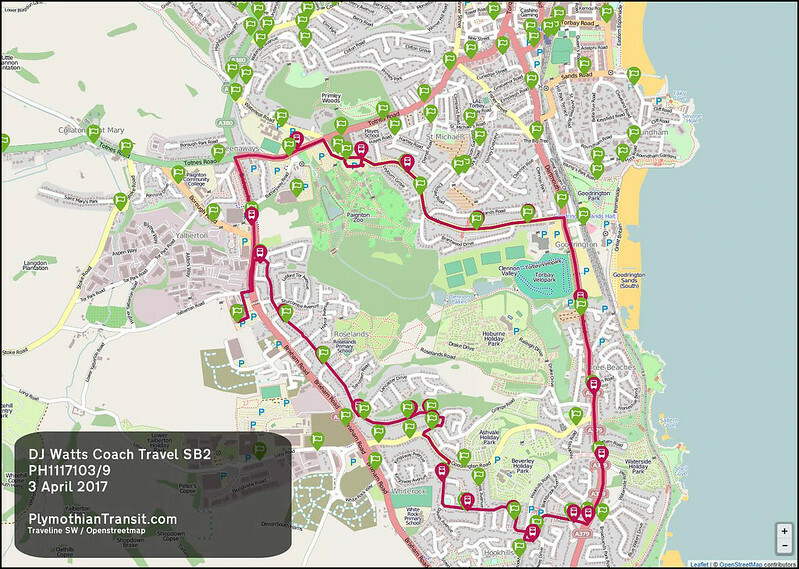 Additional time has been added to these timetables to improve punctuality in the summer, alongside three more buses being introduced to this route. 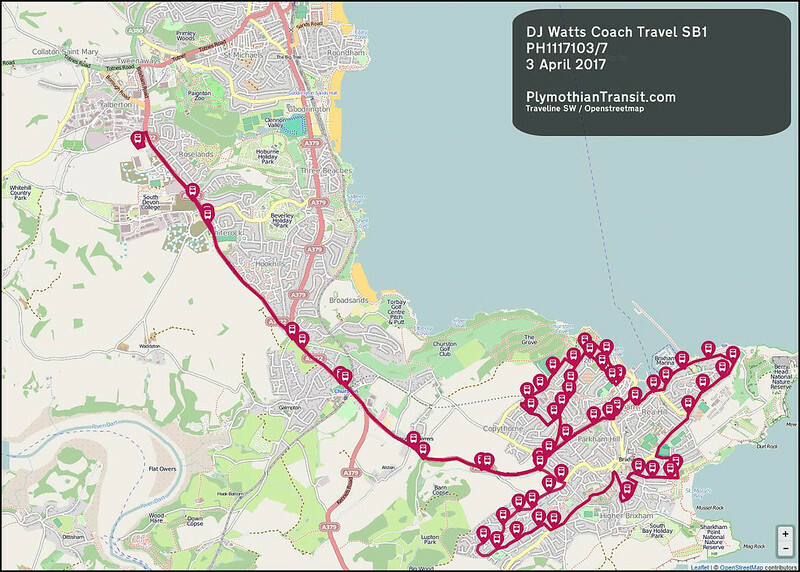 Additional time has been added to these timetables to improve punctuality in the summer, alongside three more buses being introduced to this route. Service X53 between Weymouth and Bridport will be become an hourly service along the most scenic part of the coast. Three morning peak journeys have been re timed in both directions to improve reliability. 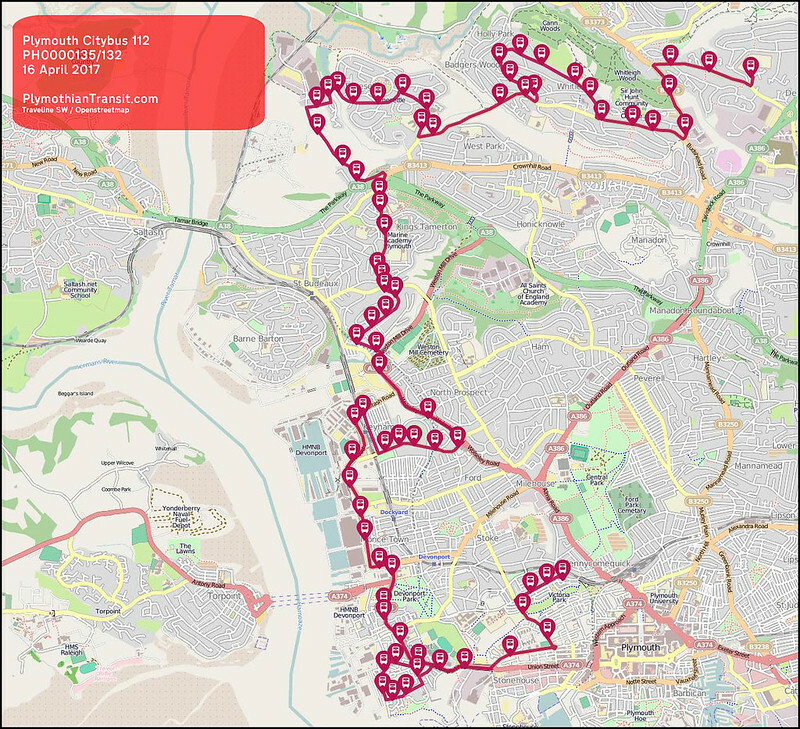 Customers are advised of changes to the route and timetable of service 14 with effect from Sunday 16th April 2017. This service is financially supported by Plymouth City Council. 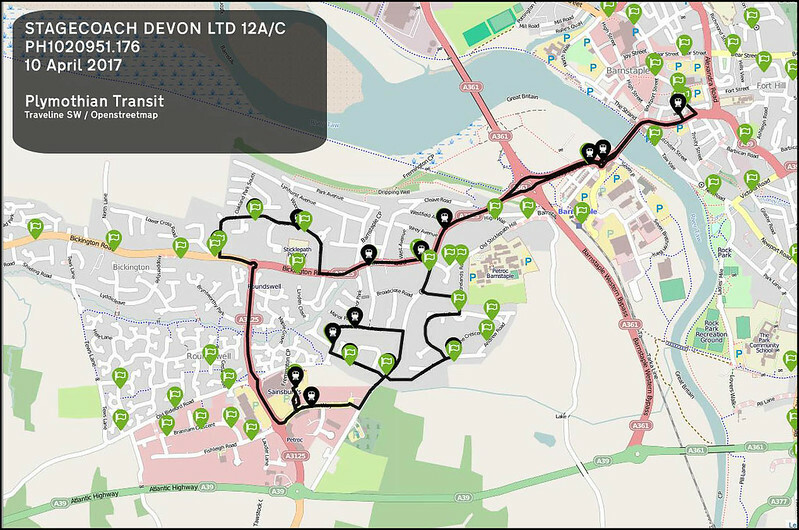 The revised service 14 will continue to operate between the City Centre and Derriford Hospital via the Rail Station, Devonport, Keyham and Ham but will no longer serve the section between The Octagon and Millbridge or the section between Granby Way and Pottery Quay. 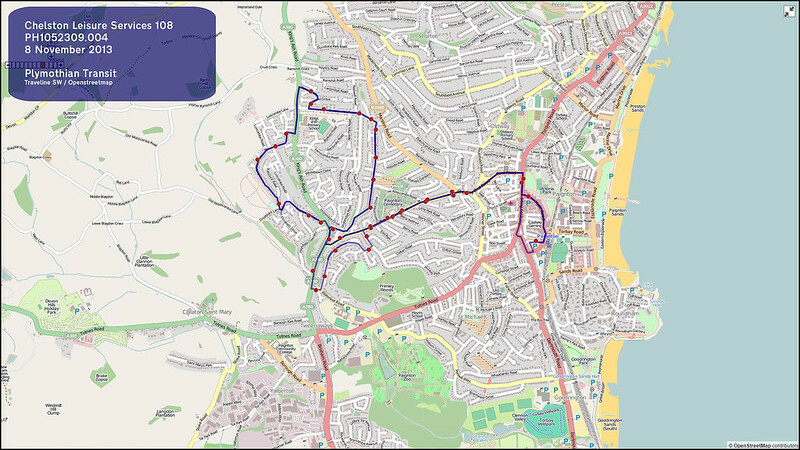 It will no longer operate via Marjon nor will it extend to The Plymouth Science Park. 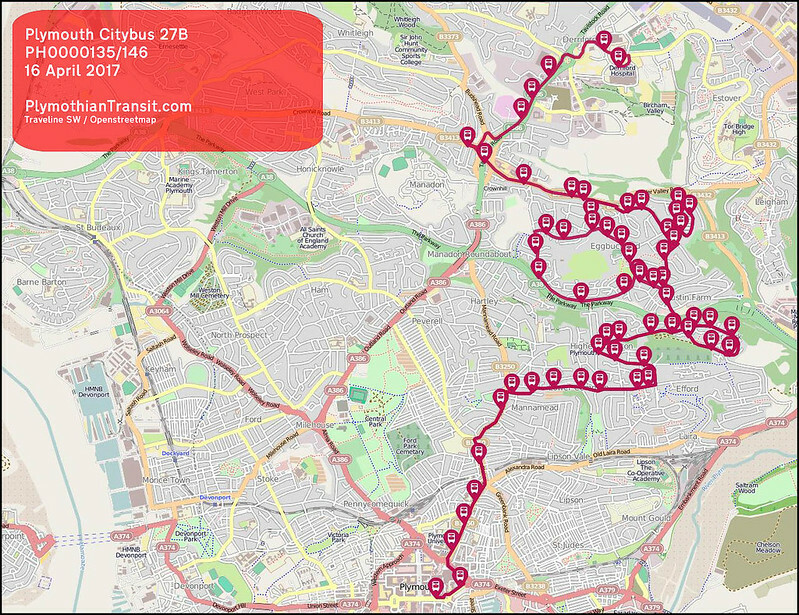 The section between the City Centre, Coxside and Cattedown will be served by the new Citybus service 15 every hour. 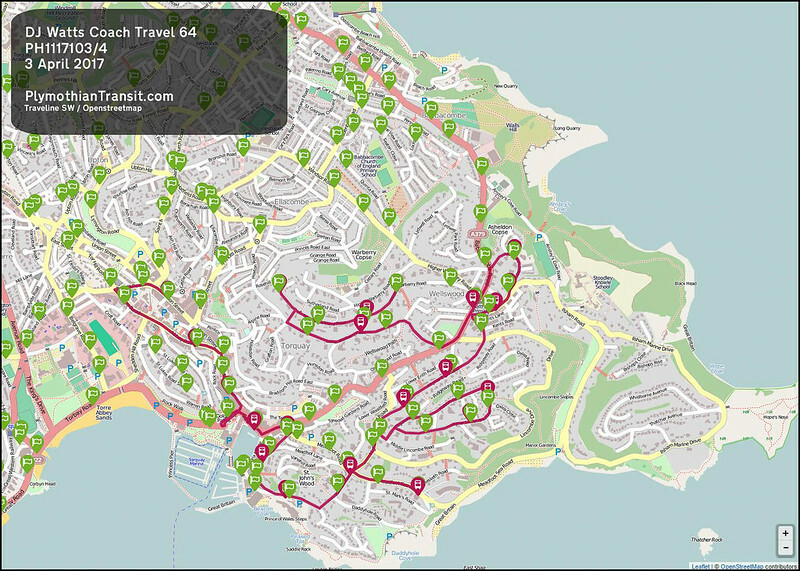 Customers wishing to travel to Plymstock should change at Royal Parade and catch services 5/5A. 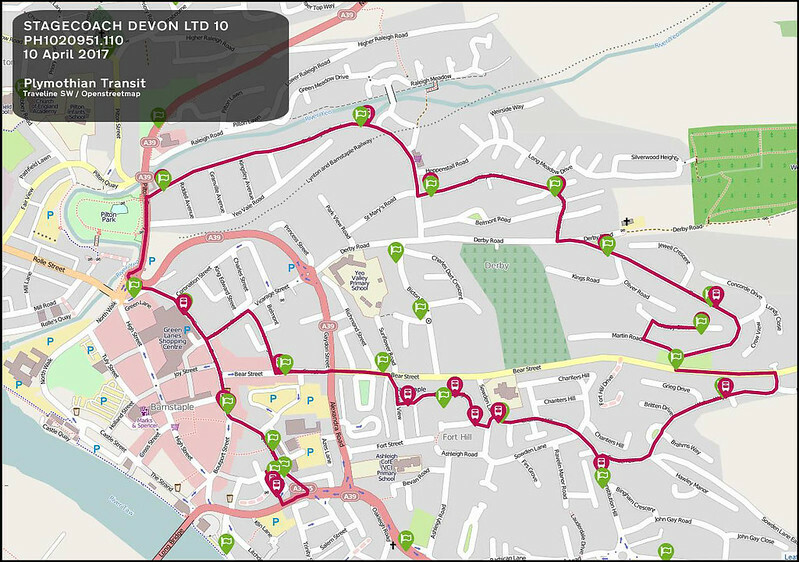 Between the city centre and Devonport Fore Street the new service 14A will provide a service every 30 minutes with the 14. 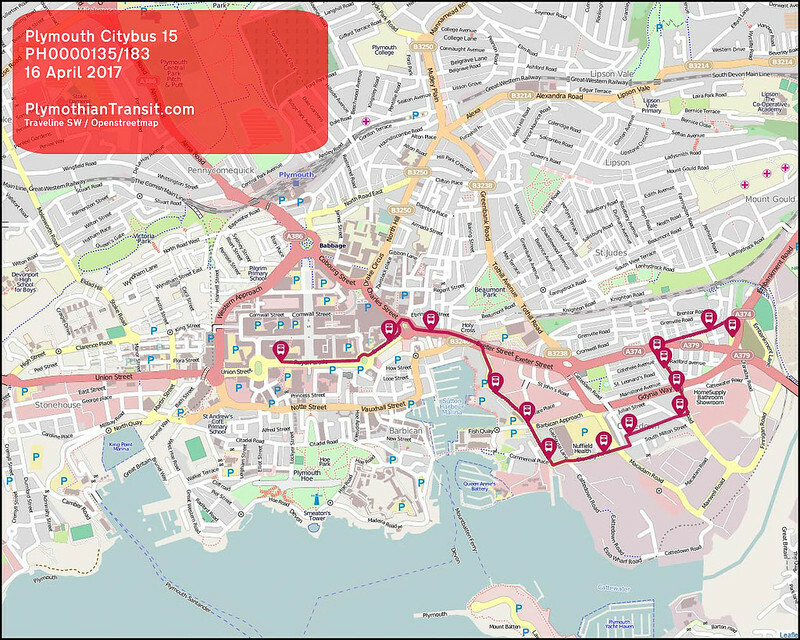 Service 14A will operate via Chapel Street to Mutton Cove and Mount Wise before returning to the City Centre. Direct links between Mutton Cove/Mount Wise and Derriford Hospital will still be provided during the morning and afternoon peaks for the benefit of pupils and Hospital staff. 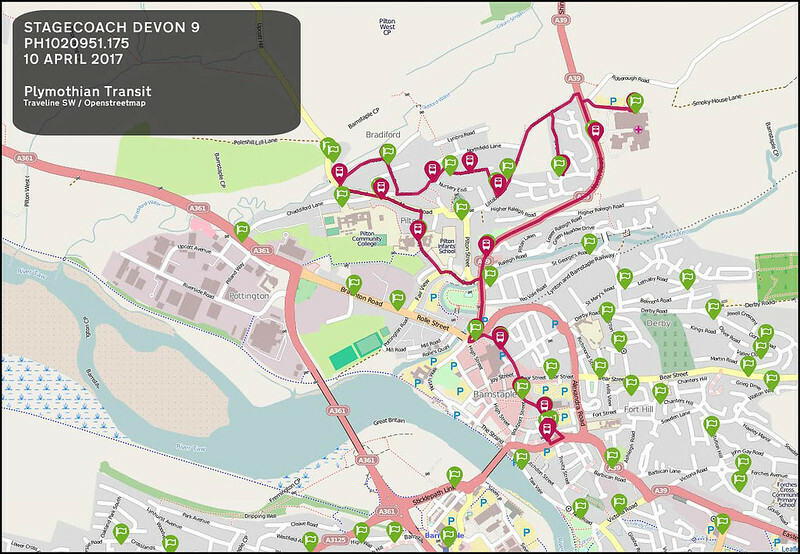 During the day connections to Derriford Hospital are available from Chapel Street on Service 34 or from Fore Street on service 14. Torpoint Ferry (Pottery Quay) will continue to be served by the 34 and 70/71 services. 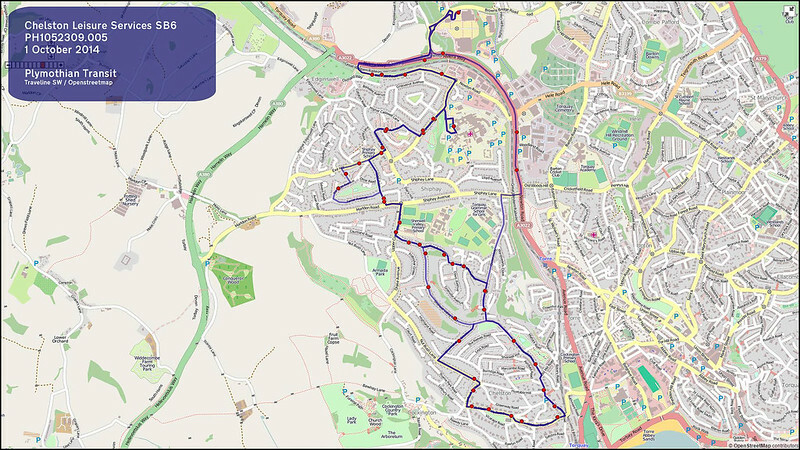 The morning school journey to St Boniface and Notre Dame will continue to operate, but the return journey will be provided by school special services 112 and 118 which will also be revised to provide students from these schools a link back to Keyham and Devonport in the afternoon. 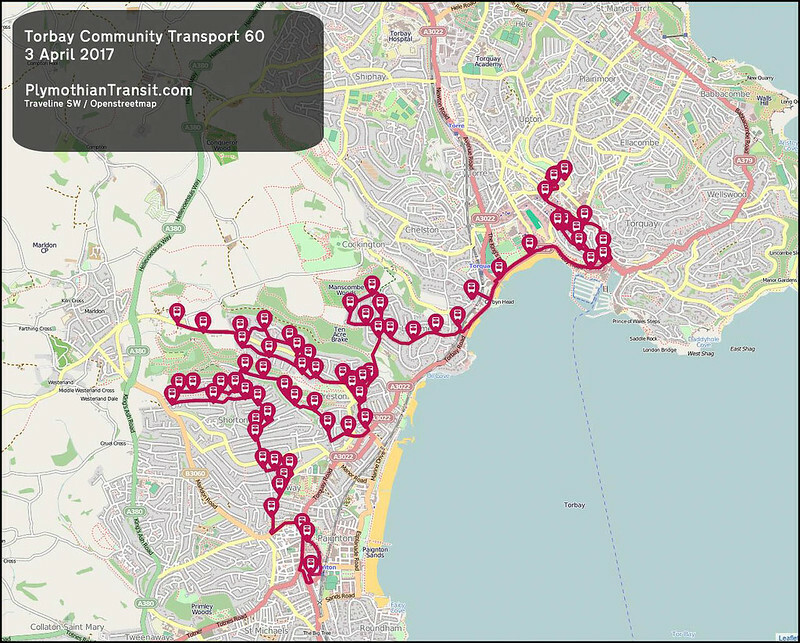 These changes are necessary in order to secure the longer term future of the route and have been undertaken in consultation with Plymouth City Council. Customers are advised of changes to the route and timetable of service 14 with effect from Sunday 16th April 2017. This service is financially supported by Plymouth City Council. 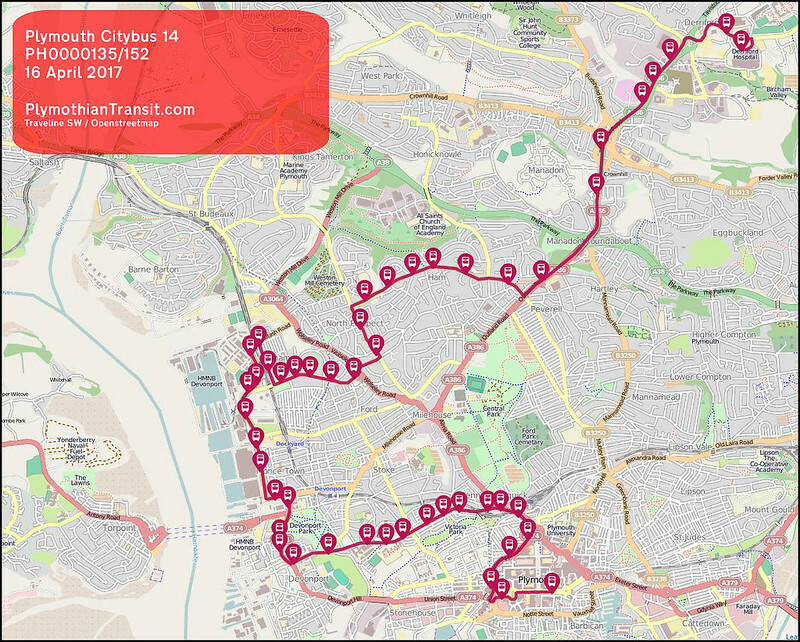 The section between the City Centre, Coxside and Cattedown will be served by the new Citybus service 15 every hour. 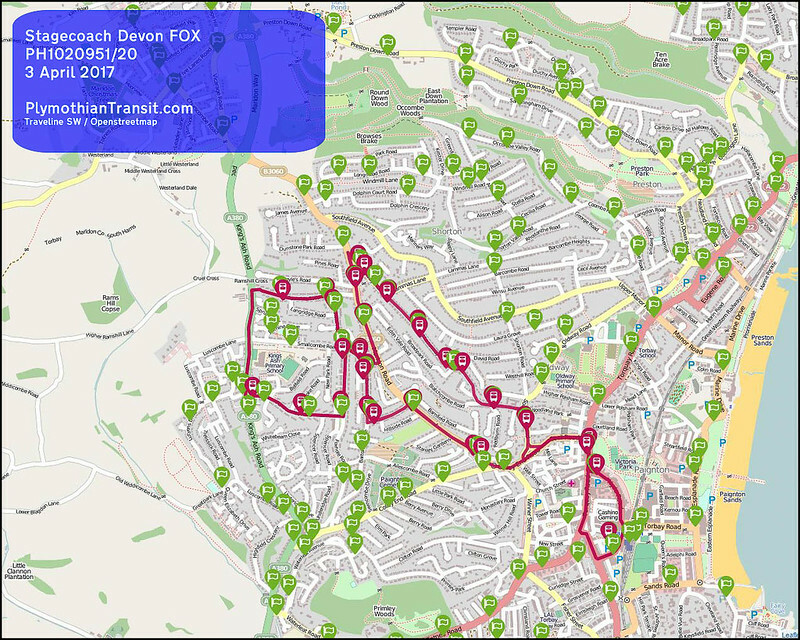 In order to provide a sustainable service to Eggbuckland a number of changes have been made to services 27 & 28. 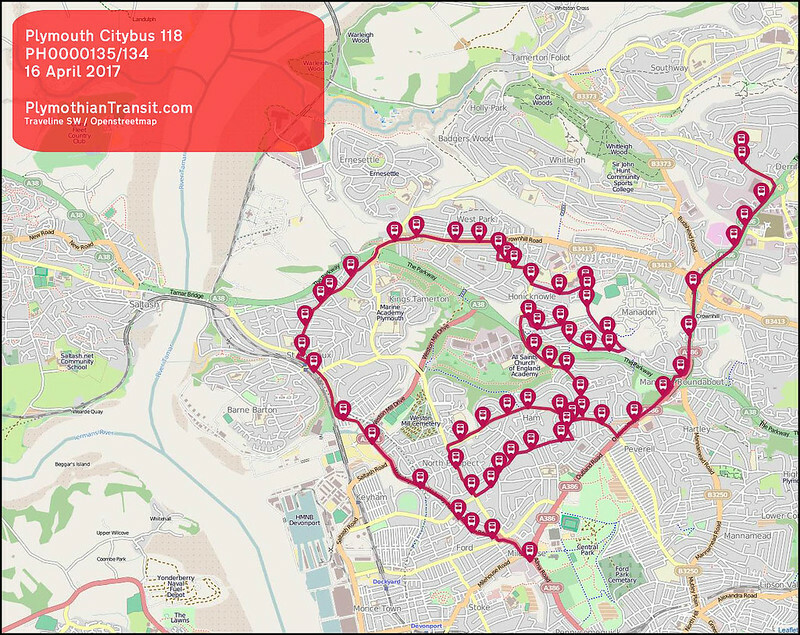 These changes ensure that a frequent service continues to operate between the City Centre, Deer Park & Eggbuckland. 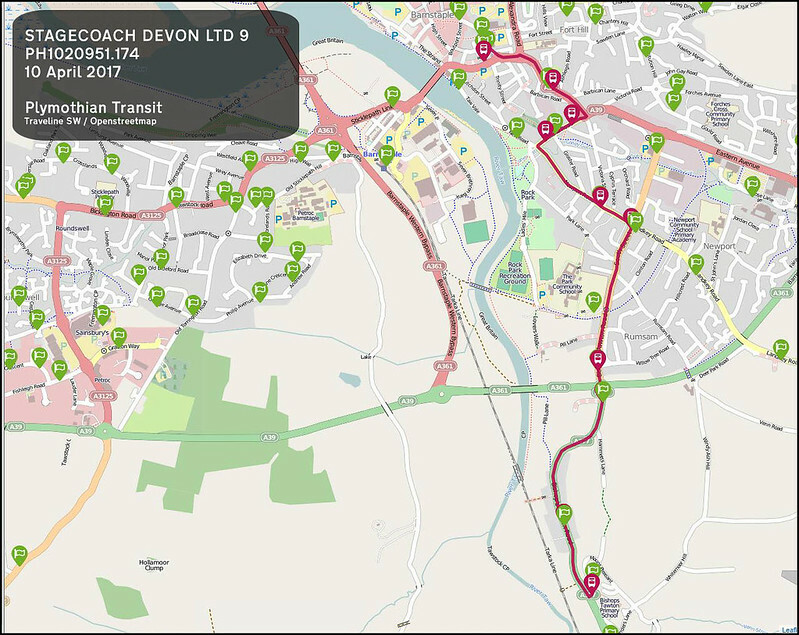 Most northbound services will terminate at Crownhill where passengers will need to change buses onto a number of other frequent services that provide onward journeys to Derriford. Due to changing road speeds through the duration of the Derriford Roadworks we have amended the timetable to suit. 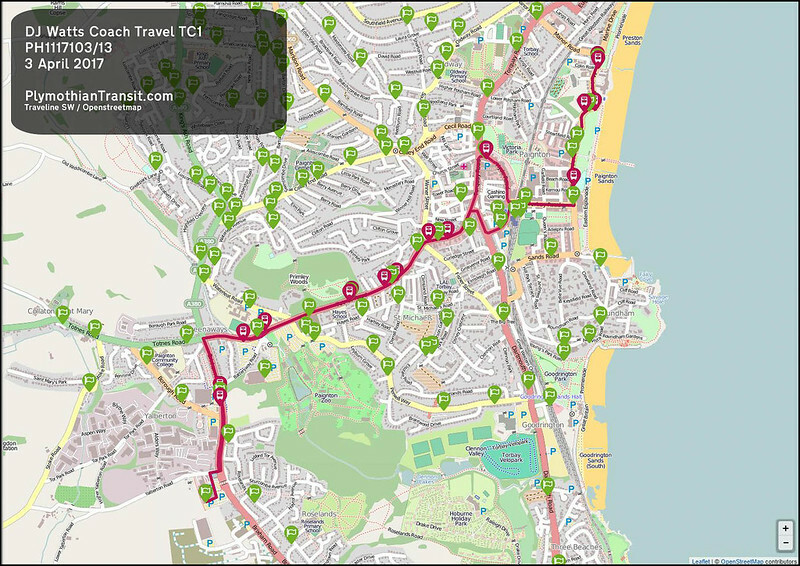 Most journeys will be re timed to maintain consistent running times throughout the day. 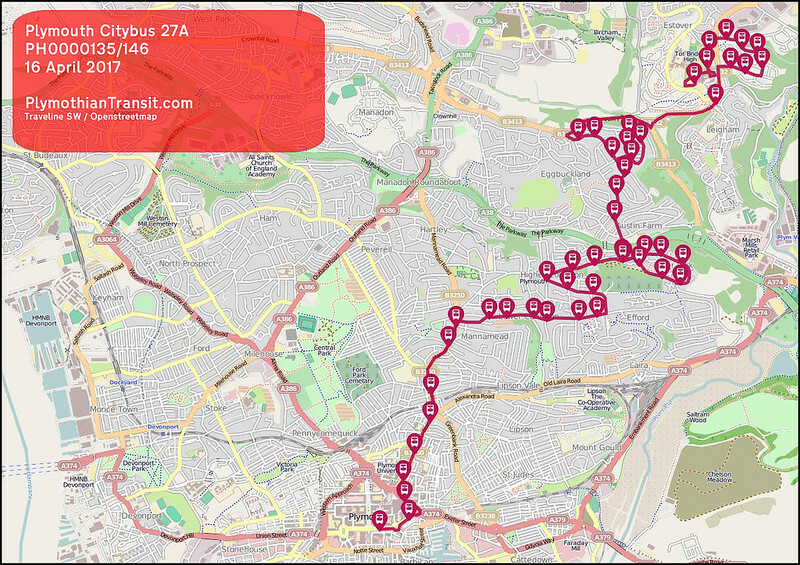 Route Number: 66 (13, 13D, 13C) No sign of a 66 service at the moment! 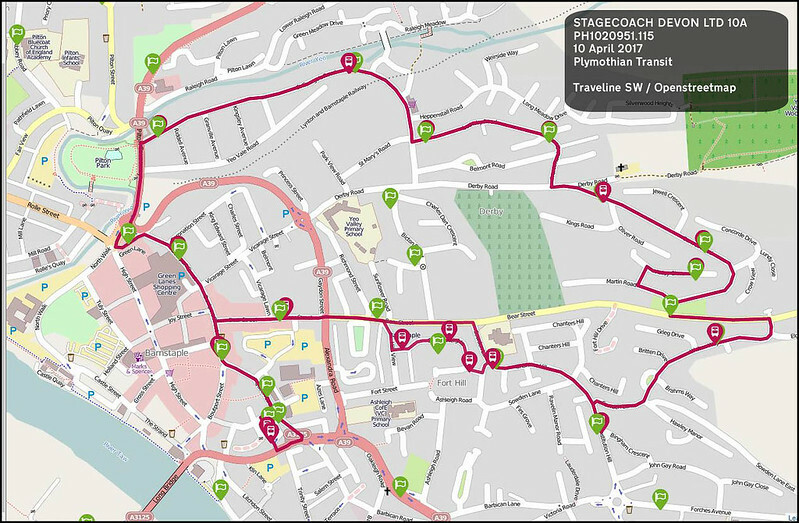 Devon County Council will also be supporting a new Saturday service on Stagecoach service 13, which will operate between Marldon, Torbay Hospital, The Willows and Newton Abbot, starting Saturday 8th April 2017, replacing this section of the withdrawn 67.
effective from 14 April 2017.